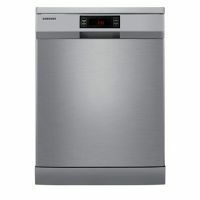 IFB Neptune FX vs Samsung DW-FN320T 12 place settings dishwasher wit powerful cleaning and energy efficiency. You can see list of our IFB VS Samsung Dishwasher|Below ₹.25000 below, perform Side-by-Side comparison. If you need further help, do have a look at Conzumr Guides and Tips. Alternatively you can view all Dishwasher to choose your own favourites. 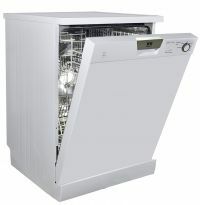 Fully-automatic front-loading dishwasher, Speed Matic dishwasher with varioSpeed for washing in up to half the time and an easily height-adjustable upper basket. The Neptune FX is an elegant white dishwasher that suits your kitchen interiors and most importantly suits your needs as well. This 12 Place Setting model comes with an Extra Heavily Soiled Program feature that helps remove even the most stubborn stains on your utensils. Also, the Height Adjustable Upper Baskets help you to load the utensils better. Samsung's Auto Wash cycle - make sure dishes get clean and minimises water and energy usage. - The turbidity sensor senses food particles in the water and knows to stop when the rinse water is clean. Samsung Dishwasher is designed to optimise the use of water during washing cycle. It washes every corners of dishes with 12 liters of water which is 5 liters less than the conventional, but the 12 liters of water never compromises washing performance. - Samsung Dishwasher uses new inner design technology to improve water efficiency than Conventional. Free Standing: Free Standing dishwasher is a portable dishwasher and can be parked anywhere when not in use. 12 Place Setting: A standard 12 place setting will hold 12 each of dinner plates, soup plates, dessert plates, serving bowls, glass tumblers, tea cups and saucers, a knives, forks, soup spoons, dessert spoons and teaspoons. To Recieve updates and possible rewards for Samsung DW-FN320T please sign in. To Recieve updates and possible rewards for Dishwasher please sign in.